​Steve laughed and told him he’d consider it, then put the idea aside. A few years later, City Lore’s Education Director, Amanda Dargan, worked on one of the first Hive NYC projects, an initiative at the New York Hall of Science with Chris Lawrence which engaged youth in documenting and measuring the noise and air pollution in Queens’ Flushing Meadows Park. In the process, she encountered skateboarders in action. Amanda and the New York Hall of Science youth were exploring the park by asking, “Who uses this space?” and “Who cares for it?” While on site, Amanda met Rodney Torres, a former pro skater, and a band of younger skaters, all of whom were using the World’s Fair Unisphere Fountain and the ledges and benches around it as a skate spot. 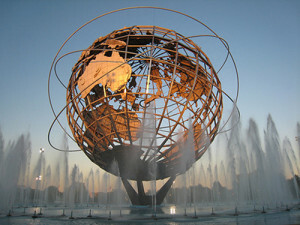 Upon interviewing the skaters, Amanda and the students discovered that the Unisphere was one of the most revered skate spots in the world, and that skaters from all over the world came to film themselves skating with the iconic globe in the background. Amanda was impressed to learn that skaters were some of the most ardent advocates for the preservation of that space for recreational use, and that they had recently petitioned the Parks Department to adapt their ideas for the current renovation of the Unisphere fountain to incorporate design features that would make the fountain safe both for skaters and for the general public. Although they were not successful, they wisely had a back-up plan – donate space for a skateboard park near the Unisphere, so that skaters could still skate (and record their skate tricks) with the Unisphere still in the background. They were successful and the Maloof Brothers donated money to build a skate park that incorporated the shapes, angles, and dimensions of many of the New York skater community’s beloved skate sites. Amanda noted the potent combination of older established skaters informally mentoring younger skaters, and the strong place-based grassroots advocacy tactics that they used, and she filed it away for a future project idea. The principles of connected learning were excellent guidelines to test out some of our ideas about how to engage skaters in an educational program. First and foremost, we knew that any project that targeted youth skaters would, by design, have to be interest-powered and peer-supported. In many cases, youth from this demographic feel particularly alienated from formal educational institutions, even those that are intended to support them, and they are fairly distrusting of adults, particularly educators. 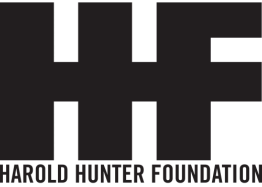 Before we applied for our first Hive Digital Media Learning Fund Spark grant, we connected with the Harold Hunter Foundation (HHF), founded in memory of iconic New York City professional skateboarder Harold Hunter who died in 2006. HHF harnesses the power of skateboarding to transform lives by providing a network of support, resources, and advocacy for NYC skateboarders so that they can reach their full potential as skateboarders and as people. Many of the very qualities, abilities, and characteristics that draw these youth to skateboarding, also make them vulnerable to a variety of pitfalls. Skateboarders have unique learning styles, and socio-emotional and behavioral needs that are often not adequately addressed by traditional organizations and institutions, particularly in resource poor neighborhoods, thereby hindering optimal development of their creativity and innovative spirit. HHF believes that skateboarding offers a healthy outlet that diverts youth from gang participation, prevents a sedentary lifestyle, builds character, provides a way to channel difficult feelings, encourages crossing cultural, racial, economic, and geographic boundaries, develops perseverance, and instills a spirit of community involvement, self-efficacy, positivity, and entrepreneurship. 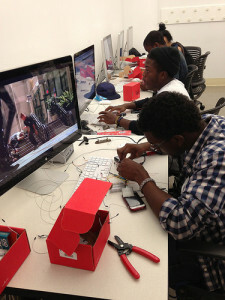 With staff from HHF and our Hive NYC partner, Reelworks Teen Filmmaking for KICKFLIP 1.0, we constructed a program for youth who do not ordinarily participate in structured learning activities. Our goal was to create a learning environment that was heavily peer-led, and that provided skaters with technical skills, critical-thinking skills, and socio-emotional support, to engage with a subject that is meaningful to them, while also offering opportunities to articulate their worldview, engage with the urban landscape, and think about their place as participants and citizens of the city. With the initial grant we tested to see if we could actually attract skaters and structure a meaningful learning process that would spark interest in pursuing further work. A daylong filmmaking jam at the Reelworks space, with follow up mentoring for students interested in polishing and finishing movies, led us to apply for a Catalyst grant to take the ideas even further and create an expanded summer skate film program. (See movies from that first-ever skate jam here, and here.) 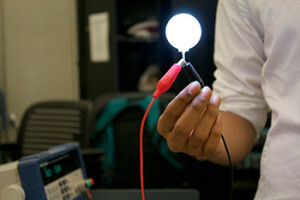 In later iterations we partnered with HHF and Parsons School of Design for intensive summer workshops in game design, coding, physical computing, and app development. Through the KICKFLIP Project we have found ways to channel and strengthen this unique perspective in a manner that leads to increased opportunities for participants to pursue their interest-driven passions. Our KICKFLIP partners saw skateboarding as a platform from which young skaters could take advantage of a range of opportunities to experiment with their own perspective and narrative voice. As one teen at Flushing-Meadows Park shared with us, “Skateboarding got me into architecture, honestly. Straight up. With architecture I can design everything according to skateboarding. But I’ll try to play it off, make believe its not really skateboarding related. When people see it when it’s being constructed they go, ‘Oh, that’s exactly what it’s like.” This student was able to articulate how skateboarding impacted his academic interests and career goals. When we spoke to him he was about to begin as his first year as an architecture major at City College. He was extremely clear about the impact his passion for skateboarding had on his career ambitions. As Thomas and Seely write in A New Culture of Learning “What messing around reveals most fundamentally is that the relationship between people and their environments is rich, complex, and changing. The process of knowing has been instrumental to being structured by a sense of play. Through the shift the experience is transformed into a process of experimentation, play and riddling, which reveals the resources and possibilities that are available to a person and what he can do with them.” Like the teenager at the park who translated his interest in skate parks and the built environment into a passion for architecture, through this project we hope to create a connection between the innate interest and passion for play that can be found in the various skater communities around the city and the potential of digital learning to enhance and complement the learning that is already taking place. When these young people put the full might of their passion and talent behind their work, the result is truly extraordinary.